In his multiple roles as a diplomat, scholar and first editor of the Atlantic Monthly magazine, James Russell Lowell (1819-1891) traveled around the globe, but what the rest of the world had to offer never impressed him as much as his hometown. "I like Cambridge better than any other spot on the earth's surface," he once said. During "Cambridge Discovery Days" on the first two Saturdays of August, Cantibrigians and others can discover for themselves some of what so enchanted Lowell. An annual event sponsored by the Historic Cambridge Collaborative, Discovery Days this year focuses on women's voices, ranging from those of Martha Washington, who visited her husband in the winter of 1775-1776 at what is now known as the Longfellow House on Brattle Street to feminist author Margaret Fuller and the "French chef" Julia Child, whose papers are housed at Radcliffe's Schlesinger Library. 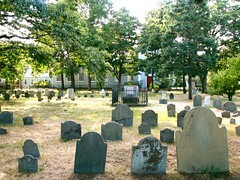 Both days also will feature tours of the Longfellow National Historic Site led by National Park Service rangers, visits to and discussions of Cambridge churches as "agents of change" in the city's history, 18th Century activities for children ages four to 12 and walks through the "Old Cambridge Burying Ground" adjacent to Christ Church on Garden Street. The event also offers the chance to explore Mount Auburn Cemetery, where numerous luminaries (including Henry Wadsworth Longfellow and Mary Baker Eddy, founder of the Christian Science Church) are buried and the opportunity on both days to "become part of history" by bringing your old photos of family, friends or the house you grew up in to the Cambridge Historical Society at 159 Brattle Street to be scanned. Those who do so will receive the thanks of the staff and free ice cream from Toscanini's. (for more information, call the historical society at 617-547-4252). The program on August 14 includes a tour of the public art installations in the city ranging from Paine Park near Inman Square to the new main branch of the Cambridge Public Library on Broadway led by Cambridge artists Phyllis Bretholz and Mela Lyman, with Lillian Hsu of the Cambridge Arts Council (for more information call the arts council at 617-349-4380). 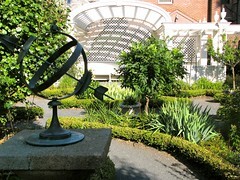 Also on August 14, there will be two programs on Margaret Fuller, one in the garden behind the Longfellow House at 105 Brattle Street at 1 p.m. and one at the historical society at 3 p.m. Presented by Jessa Piaia, creator of "Women in History Programs," it will let participants see Fuller as she was in August 1845, when, according to the program guide, she was back from her stay in Manhattan and "reminiscing about her growing up days in Cambridgeport and Boston; her literary achievements and encounters with the Transcendalist circle in Concord and Brook Farm residents in West Roxbury; and her present employment as first female editor and literary critic for the New York Daily Tribune.". Mary Leno, formerly of the Cambridge Women's Commission, will lead a tour and discussion on "The Women of Central Square," with stories of women including Maria Baldwin and Charlotte Hawkins Brown and a visit to the country's oldest women's center. The event is scheduled from 2 p.m. to 3 p.m., beginning in front of the Cambridge City Hall (for more information, call 617-349-4697). From 1 p.m. to 2:30 p.m., Chief Ranger Jean Rogers will lead a program titled "Women: Their Presence, Influence and Use of Fresh Pond," outside the Cambridge Water Department at 250 Fresh Pond Parkway (or indoors in the case of rain). Call 617-349-4793 to register for the program and for more information. From 3 p.m. to 4 p.m., Natalie Moravek of the Cambridge Historical Society will conduct a program on William James, who has been called the "founder of the American psychology" studies, beginning at his former home at 95 Irving Street. The program guide says Moravek will explore "James' life in Cambridge, his remarkable family (his brother was famed author Henry James) and his relations with academic followers and rivals." From 3:30 p.m. to 4:30 p.m., Revolutionary War historian J.L. Bell will lead a program on "The Ladies of Tory Row," with a tour starting at the corner of Brattle and Mason streets. Known before the Revolution broke out as the "King's Highway" and "Tory Row," Brattle Street was the main thoroughfare for Cambridge's richest and most elegant neighborhood. The tour will examine the lives of the women who managed households there from just before the war of independence to the early days of the American republic. For more information, go to: www.boston1775.net. Tours of the Longfellow National Historic Site at 10:30 a.m., 11:30 a.m., 1 p.m., 2 p.m., 3 p.m., 4 p.m., with a $3 admission charge (children 15 and under free). From 1837 to 1882, this grand house was the home of Longfellow, a poet and scholar, and a gathering place for literary figures including Nathaniel Hawthorne, Julia Ward Howe and Ralph Waldo Emerson. Prior to Longfellow, when Washington lived there, he had visitors including Benjamin Franklin and Benedict Arnold. The tours will include readings from poems, letters and diaries. For more information, call 617-876-4491. Visitors also will be able to see the restored formal heritage garden behind the house. 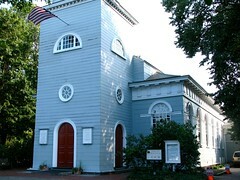 For a full schedule of events for Cambridge Discovery Days, go to: www.cambridgema.gov/historic/walks.html. Pamphlets with the schedule also are available at the entrance to the Longfellow House at 105 Brattle St.
Cambridge Discovery Days is presented by the Historic Cambridge Collaborative, an informal group of nonprofit historical and educational instiutions working together to develop public programs that celebrate the city's history. Members include: the Cambridge Historical Commission (www.cambridgema.gov/historic, 617-349-4683); the Cambridge Historical Society (www.cambridgehistory.org, 617-547-4252); the Longfellow National Historic Site (www.nps.gov/long, 617-876-4491); the Friends of Mount Auburn Cemetery (www.mountauburn.org, 617-547-7105); and the Cambridge Office for Tourism (www.cambridge-usa.org, 617-441-2884). Cambridge Discovery Days is funded in part by a grant from the Massachusetts Cultural Council. Great story, Karen! I look forward to participating in these interesting events and learning more about the history of our fair city.